In celebration of the 200th anniversary of the Manhattan Grid, Mapping the Cityscape focuses on the ways in which mapping influences our perception of the environment. Historically, cartographers created maps to document the built environment to ease navigation and ensure the safety of both city dwellers and travelers. With developments in desktop publishing, mapmakers were empowered with tools to create diagrammatic and interpretive maps that conveyed more layers of information. Maps began to move beyond the pure documentation of our surroundings to a more holistic understanding of place. Technological advances, including the advent of GIS (Geographic Information System), Google maps, and smart phone technology, have further expanded the scope of the medium to embrace user-generated input. This has also enabled the juxtaposition of more complex datasets, resulting in more publicly accessible information. 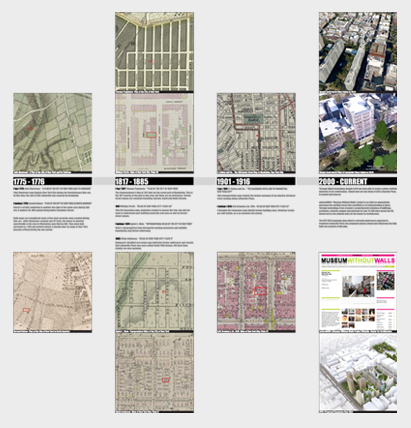 Mapping the Cityscape addresses the state of mapmaking by showing some of the most provocative maps of Manhattan from 1609 – 2011, including ecological, historic, transportation, planning, cultural, civic data and aerial maps. We encourage design professionals from all disciplines and the general public to explore and engage these new methodologies to better shape our urban landscape. The Environmental Simulation Center, Ltd.